The elder brother of P-Square, Jude Okoye may have finally put to rest the believe that he was not in support of the marriage of Peter Okoye. Jude was absent at the occasion and was rumoured to have been in Lagos with Wizkid and Don Jazzy at the Mavin Records studio, going by a picture posted by him. Also, during the brothers' tour of Tanzania, which was just days after the November 17 wedding, Jude was not with them. 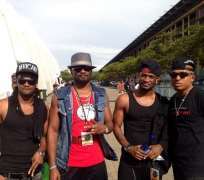 But Jude has now been spotted with P-Square in South Africa ahead of the Channel O awards taking place in the Nelson Mandela's country. He also posed with top rapper, Naeto C in the photograph. Jude is the manager of the brothers. He has been part of the group since it was formed and he handles virtually everything about the P-Square brand.